FOR 20 YEARS, our local community has been polled to discover which performers In! Asbury Park have been the best in a broad variety of categories and genres. This year's gala event, Hosted by 90.5 The Night's Music Wizard, DJ Jeff Raspe, Host on WBJB-FM Brookdale Public Radio, and Sponsored by FETISH, Asbury Park's first Rock 'n Roll clothing store. 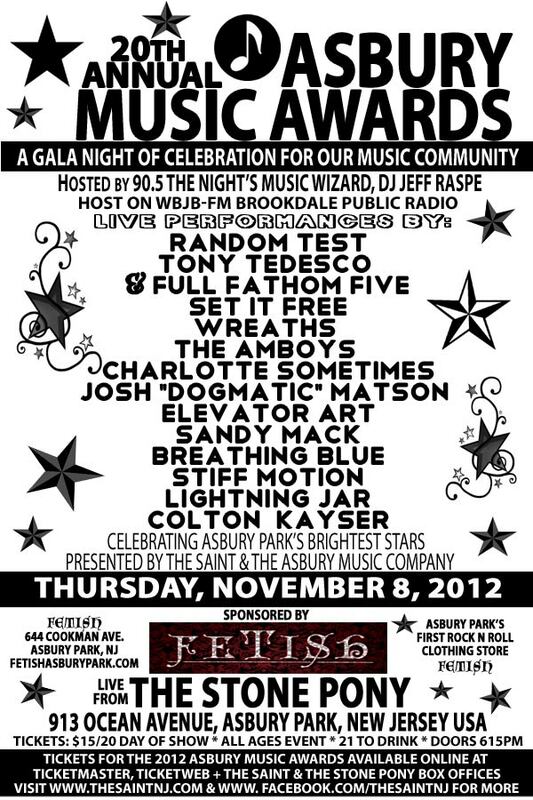 Like years past, the 20th anniversary of the Asbury Music Awards show, on Thursday, November 8th, features only the very best music and creative talent that Asbury Park and the Jersey Shore have to offer. ASBURY PARK's MOST ROCK 'N ROLL NIGHT, a regular haunt of well known faces and where to see the future next big things in advance. Where glitz and rock 'n roll and behind the scenes heroes of today and yesterday meet, an awards ceremony, a pageant, a mad carnival, starring who's who and on the rise in rock 'n roll in Asbury Park and at the Jersey Shore. Area clubs, music-centric businesses, record stores, radio stations, newspapers and time tested music enthusiasts are all represented in the voting process. Ballots are painstakingly counted, votes are tallied, and the winners are revealed for the first time at the Asbury Music Awards ceremony. A variety of local music alumni, past award recipients, sponsors, and industry professionals are invited by the panel to present awards each year. The Asbury Music Awards, celebrating a milestone 20-year anniversary, will prove to be our biggest and best event yet, celebrating local musicians, singers/songwriters and our artistic community in support of live original music and the imaginative forces that drives creative Asbury Park, NJ. TO LIVE IN A CITY LIKE ASBURY PARK, and to get recognized for being at the top of your genre, is a special achievement and prestigious recognition. The founder of the Asbury Music Awards says he is determined to make the AMAs the best they can be, and understands why the community has championed and contributed to making this annual celebration of our creative community a jubilant and growing success for two decades. "If you take a look at the broad line-up of musicians and artists who are performing at this year's Asbury Music Awards on Nov. 8th, including all performers, nominees, award presenters and winners, you will get a glimpse into the breadth and depth of Asbury Park's rich artistic culture" said Scott Stamper, founder of the ASBURY MUSIC AWARDS, also founder / owner of THE SAINT, home of live original music in New Jersey and the longest running music venue in Asbury Park's history. "Each year, the Asbury Music Awards shines a beacon of light on Asbury Park's brightest stars, recognizing as many genres, sounds and expressions that we can possibly represent in one celebratory night," said Stamper. THE 2012 AMAs are currently accepting sponsors and program guide advertisers. The 2012 AMAs sponsorship and program guide advertisement opportunity provide a vehicle in which local businesses and individuals can be a part of, and show their support for the long-standing, ever-evolving original music scene and those who make up our creative community. It is only through your support that we can continue to grow, with hopes of shining a national spotlight on this annual event. If you have interest in supporting the AMAs through sponsorship and/or placing an ad in this year's program guide, please contact founder, organizer and event promoter, Scott Stamper via email at [email protected] or message him direct on Facebook. Thank you in advance for your anticipated support and be sure to save the date and join us for Asbury Park's most rock 'n roll night out, Thursday, Nov. 8th, at the legendary and biggest rock 'n roll landmark on the East Coast, The Stone Pony, located at 913 Ocean Avenue, in Asbury Park, NJ USA, sponsored by FETISHASBURYPARK.COM, Asbury Park's 1st Rock 'n Roll Clothing Store. ALL NOMINEES TO BE ANNOUNCED SOON. While the AMA panel is targeting a Thursday announcement, like years gone by, there are always unexpected delays and so, it would be more realistic to expect all nominee announcements Saturday, Sunday, even as late as Monday, but hopefully, no later than this. Nominee announcements are made available to the general public as soon as humanly possible. Ensuring first, all ducks are in a row, I's dotted, and T's, crossed. Stay-tuned and thanks in advance for your anticipated patience and support. Be sure, we'll let you know as soon as they are available, ALL 2012 20th Annual ASBURY MUSIC AWARDS Nominees so stay-tuned to ASBURY MUSIC AWARDS online (all caps), THE SAINT on Facebook, THE SAINT's official website, and SUPPORT LIVE MUSIC IN ASBURY PARK, NJ for ALL official and up-to-the-minute news, nominees, special guests, and announcements.